It’s time to check the email filters and guess what we found? Yet another phishing email targeting PayPal users. This phishing email asserts that it is not a spam email. It tells the recipient what to do if the email is in the spam or junk folder. The instructions are to move it from the spam folder into the inbox. The email states that it has been marked as spam due to “Our new security update”. Don’t believe this story. This email is fraudulent. Figure A shows the email. Credit must go to the forgers, as this email looks like a PayPal email. The subject line of the email is “We’re investigating a PayPaI payment reversaI (Case ID #PP003-498-237-882)”. The sender of the email is “PayPaI” or similar. The email domain looks like the PayPal domain. An “I” is substituted for the “l”. This is a common trick used by criminals. The subject line of the email is intended to set alarm bells ringing. It is a call to action. The email reinforces this by stating up front that the user’s PayPal account “has been limited”. The email contains three links, none of them to PayPal. All the links are to a domain name that resembles PayPal. One of the links uses the genuine PayPal URL as anchor text. Once again, this is a ploy used by criminals to entice users to click on the link. 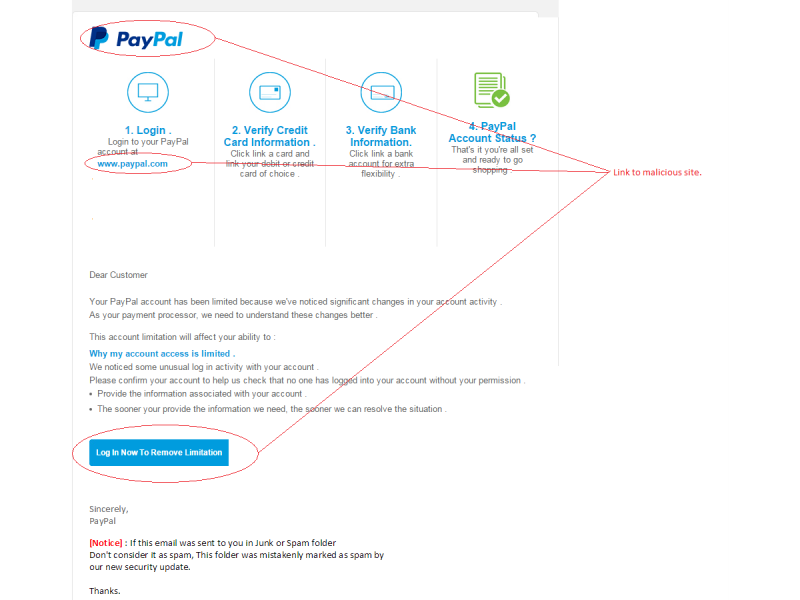 The email sets out the steps required to re-enable the user’s PayPal account. As expected, one of the steps requires submission of credit card details and/or bank account details. The user can click on any of the three links to begin the process. Finally, the notice declares that the email is not spam. If it is in your spam folder, then that is a mistake caused by a security upgrade. This email is a fake email. Checking the web links shows that they lead to a phishing site. There are other signs too. The email is not personalised. PayPal use personalised emails. The grammar is poor. This email is a fake. Delete it.